If you have read much of anything health related in the last year you very likely ran across the term “Bone Broth”. When I first started seeing classes pop up and articles about Bone Broth it sounded to me like a strange new fad. After a quick look I discovered what you all probably know. Instead of a new fad Bone Broth is simply old fashioned broth made with bones like many of us have eaten all of our lives and our parents and grandparents before us. Home made soup was the first real food I learned to cook as an adult and I am convinced that regularly eating bone broth has been a part of my incredible personal testimony of healing. As I started to look deeper into the health benefits and interest around Bone Broth I was surprised. Soup is my favorite food and I would have assumed most people made bone broth frequently. I don’t mean drinking it for breakfast daily like some people are now doing for health. I simply mean once or twice a week bones are cooked long enough to make a bone broth that you would use for soup, stew or sauce. What I found is that with the S.A.D. (Standard American Diet) by far the majority rarely if ever consume Bone Broth. So perhaps some of the excitement over the health benefits are really the renewed understanding of how real foods heal and benefit our health. When we replace real foods like hormone free meat and chemical free fruits and vegetables with processed foods our health suffers. I love all kinds of Bone Broth. My family by far prefers chicken broth. I also might have assumed that everyone makes chicken noodle soup often. I might be wrong about that! I will include very basic chicken bone broth instructions below. The recipe below may look like it has a lot of steps, but it is really very simple, flexible and delicious. Enjoy! 1 Tablespoon organic chicken base or salt to taste. Place the whole chicken in a slow cooker or your Dutch oven. Cover with water and simmer until done. Slow cookers vary, but normally 4 hours on high. When simmering in the Dutch oven about 2 hours. Remove the chicken and allow to cool. Strain the liquid. Add the liquid back to the slow cooker or Dutch oven. Remove all the meat from the bones and refrigerate. Place the bones back in the pot and continue to cook. In the Dutch oven for 6-8 hours and in the crock pot about 24 hours. Would you rather watch a video on bone broth? Dr. Josh Axe web site has a great one here. Put the oil into your Dutch oven and heat to medium. Add the shallots and cook for about two minutes. Add the bone broth and lemongrass and cook for about 20 minutes. Add the next eight ingredients (up to the noodles) and cover with bone broth. Cook for about 15 minutes or until vegetables are tender. Meanwhile prepare the noodles if needed. Toss in the remaining ingredients including the chicken meat that was set aside when making bone broth. 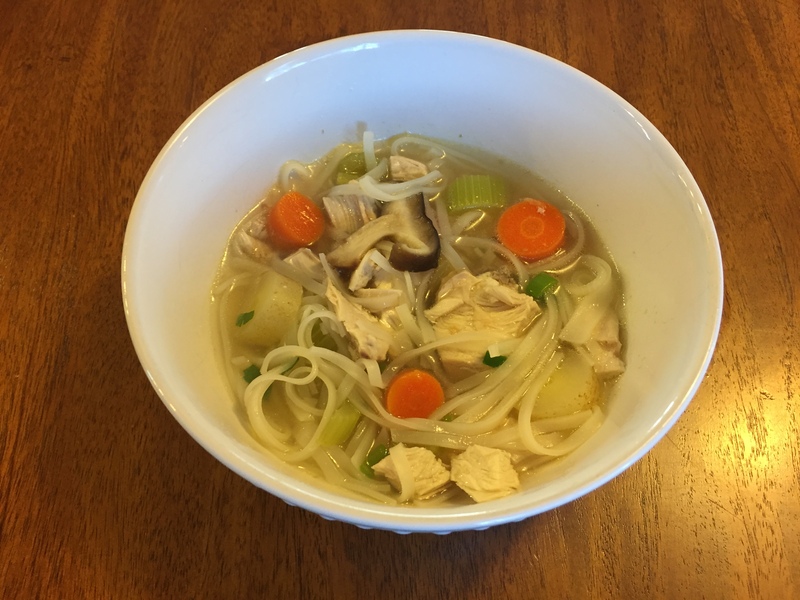 This entry was posted in Carrot, Celery, Chicken, Garlic, Ginger Root and tagged Asian Bone Broth Soup, Asian Soup, basic bone broth, Bone Broth Soup, Real Food Soup. Bookmark the permalink.